And we pay money to do these? 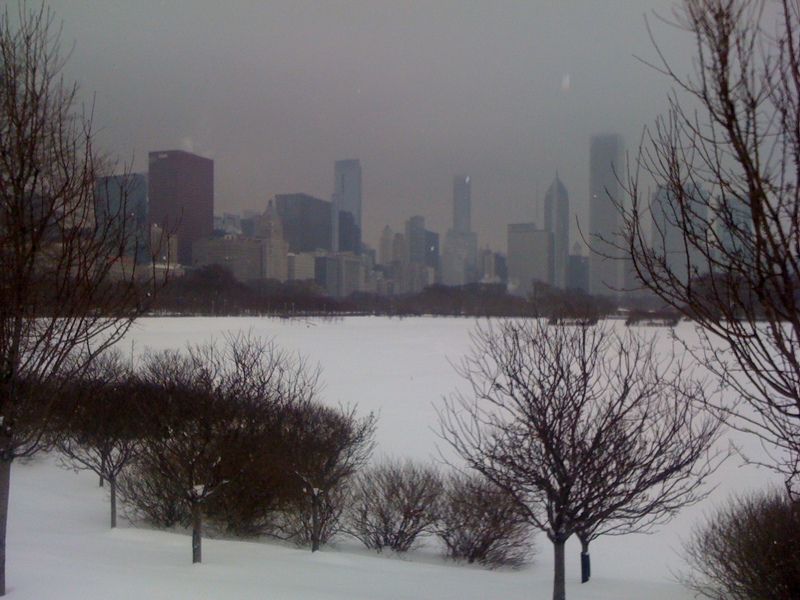 New Year’s Eve was approaching in Chicago and the winter was being wacky. There had yet to be any significant snowfall, it was not uncommon to have days in the 50’s and frankly, everyone was loving it. But with such strange weather comes a sense of foreboding: any minute now, it’s going to get bad. Really bad. But January 1st came and went and the warm spell stayed. Chicago wasn’t alone – large swaths of the Rocky Mountains found themselves completely dry, many ski resorts covered in artificial snow, the real thing having forgotten to make its grand entrance. So when the forecasted Hi is in the 50’s and a new half marathon rolls into town, you sign up and gleefully anticipate a fast time. 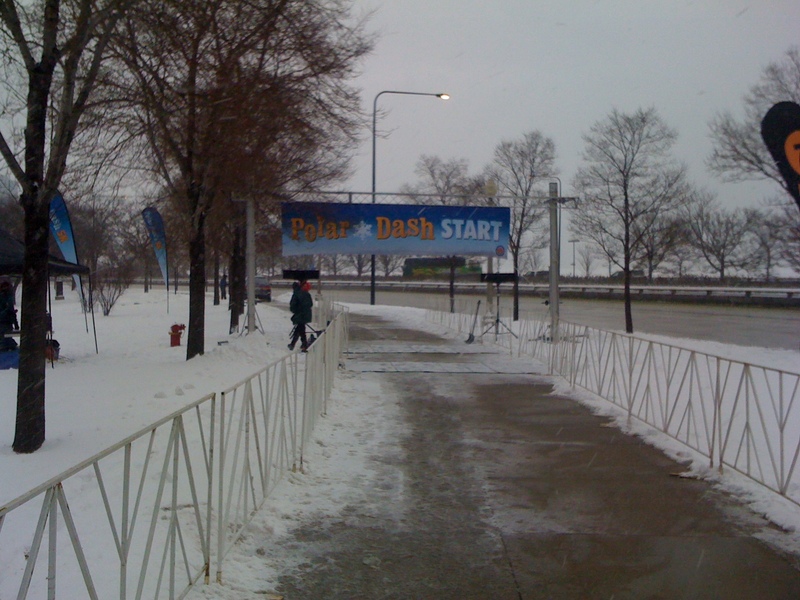 Team Ortho, a Minneapolis-based group that promotes health through research and organizing races, brought their Monster Dash Half Marathon to Chicago in 2010, and in 2012 brought their winter-themed Polar Dash Half Marathon. I saw an ad for it, caved, and signed up for the first race of 2012, scheduled for January 14. And then, right as I received my confirmation email, winter was released from its frosty prison and rushed into the area with its chilly embrace. Weather stations and channels everywhere were reporting an imminent snowstorm, winds ravaging rural areas and creating enormous snowdrifts, traffic and highways being crippled and scrolling capital letters skating on the bottom of television screens. The worst of it happened about two days before the race. With this unwanted reminder that January in Chicago is supposed to be awful, the Chicago Police Department asked that Team Ortho cancel the running event. Instead, they postponed it to the following weekend, January 21. The response on their Facebook page was vitriolic. But at least they postponed it. It’s standard practice to allow races to cancel for weather-related reasons and their responsibility towards runners is nothing when it comes to refunds or consolations. But given that it was the inaugural Chicago race, I’m sure they felt obligated to do everything possible to make it happen, hopefully for a date with weather that doesn’t threaten lives. But as the week went on, it was becoming apparent that the new date was going to be exactly the same, if not a bit worse than the original one. Another large snowstorm slammed the Midwest and Rust Belt on Friday, covering the Windy City in as much as 6 inches of snow. There were no notices of cancellation, so I assumed the race was still on. Ready for some cold business. It had been a while since I had woken up at a normal time to race. I was up by 7 and spent about an hour putting myself together. I had never put on so many layers to go for even a training run, let alone a race. 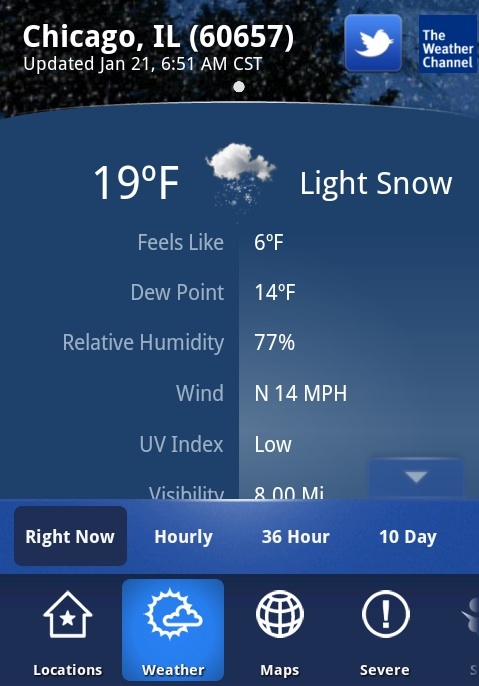 But the phone was telling me that it “Felt Like” 6 degrees Fahrenheit, and I wasn’t in the mood to die. I put on a compression layer, a tech shirt on top and a windbreaker to keep my torso and arms warm. My legs were also triple layered and I chose to opt out of wearing long tights because they get really uncomfortable after 7 miles. A black compression balaclava completed the outfit and I was out the door by 8:30, the start about thirty minutes away. There was a crowd already huddled around the start area, almost everyone shuffling back and forth to keep blood flowing. I noticed only three other runners in shorts, and I made sure to point them out and high-five them. Contrary to weather reports, it was still snowing and there was a noticeable wind coming off the lake and scraping our limited patches of exposed skin. After trudging through snow to get to gear check and then the warming tents, my shoes were already a bit wet. Organizers had posted on their page the night before that paths were being cleared, but with snow still falling, I was skeptical. There was no way this would be a pleasant experience. “$&%# this stupid idea,” Otter’s text read that morning. The first two miles would further confirm his sentiment. I could barely feel my toes despite my wool running socks and my fingers, which were padded by two layers of gloves, were frozen. For about a half mile, I actually ran with my hands in my jacket pockets to try and warm them up. But that didn’t last long, as it was messing with my balance. Every step around Grant Park up until we reached Shedd Aquarium was covered in a thin layer of slush, which added a hint of trepidation to every footfall and slowed me down. There were also parts during these miles where we were running almost single-file with the person in front of you kicking snow into your shoes. Finally, winds coming off the lake were blowing snow into every runner, frosting everyone’s left side with a thin sheet of silver. Sometime during this struggle, as I discovered that Lake Michigan had been replaced by an endless sheet of wrinkled ice and snow, I found myself thinking, why am I doing this? 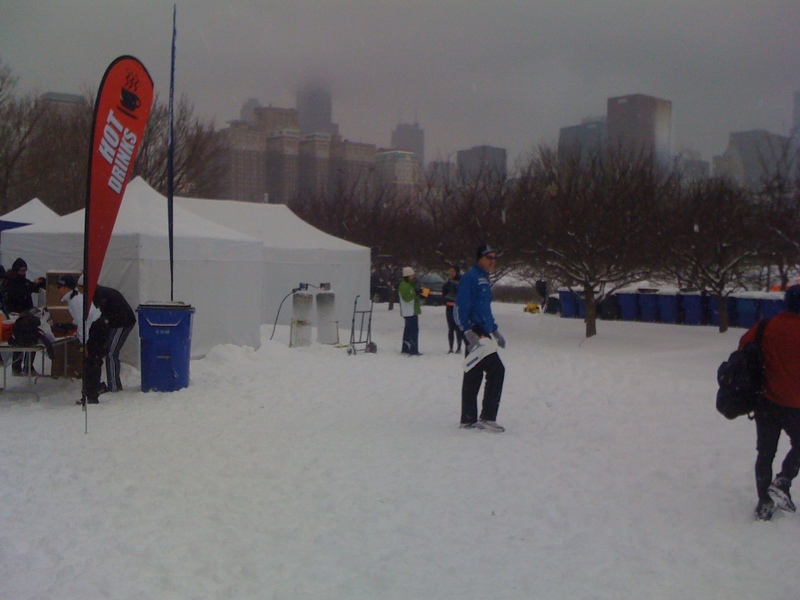 Once at mile 2, the course has made its way to the lakefront running path, which had been decently cleared, but was still very narrow. Passing runners was a game of speeding up and getting back in line. A large chunk of them was running the 10k distance and I was looking forward to their turnaround point to give me some more elbow room. However we soon learned, much to our dismay, that we wouldn’t be so lucky. I should have noticed it earlier when the mile marker flags were “off” somehow, but it was made completely apparent when everyone made a U-turn around mile 3.5. My guess was that they didn’t clear a path far enough down the lakefront because too much snow had accumulated. So, at the last minute, the organizers had turned the half marathon into a two-loop course. I’m not a huge fan of that. My first ever half marathon was a two-loop race and even without the knowledge of what other races could be like, I found myself wishing it weren’t. There’s something about retracing your steps but with more fatigued legs that can be psychologically challenging. You know what’s coming and how much you have left because you’ve already done it. The tiny corridor that we had around Shedd Aquarium would have to be passed not twice, but four times now. It wasn’t the most heartening news but what choice did we have? 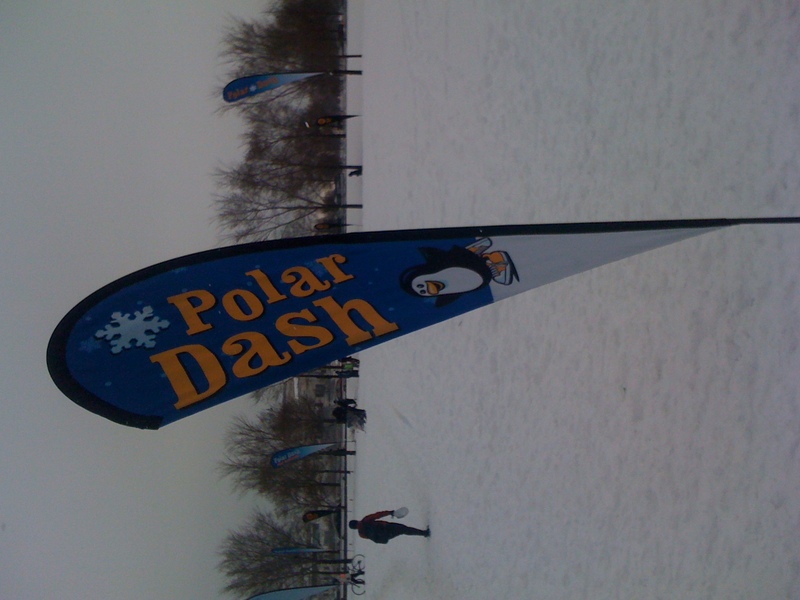 At the 10k mark, I crossed the finish line, ran under the blue “Polar Dash” banner, past the frozen volunteers holding medals and started the second loop. There were much fewer people this time around and fortunately, I didn’t come up against the back of the pack runners at all, except for a few 10k walkers, but they were easy to sidestep. That said, the path was still slushy and the wind still sliced through us. The good news was that my fingers and toes were now warm. However, the water stations weren’t handing out cups, but rather small bottles. Not wanting to be wasteful, I held onto the bottle for the rest of the race and took sips whenever I felt like it. But I did notice that whatever hand was holding the bottle would get colder, as it wasn’t curled into a fist. By the turnaround at mile 10, I was feeling fine. The three layers of clothing were keeping me warm but not suffocatingly so. It wasn’t a PR day by a long shot, but that didn’t mean I couldn’t get a decent time. I started picking it up slightly, or so I thought, and after throwing my water bottle in a trashcan, started my dash to the finish. Once back in Grant Park, the race goes under Lake Shore Drive and then rolls uphill for the final 0.1 miles. Feeling relieved, I ran under the blue banner for the third time that day, finishing in 1:41:56. After getting my bag I went to the race’s warming tents and changed into dry clothes. I didn’t feel like I had just run a half marathon – in fact, my legs felt fine. I have two reasons that might explain this. The first is that the snow and wind made me a more cautious runner and the resulting slowdown kept me from overdoing it. The second reason is that maybe the arctic temperatures acted like an ice bath on my legs, providing an almost therapeutic post-race polar massage. I’m not putting any money on it, but who knows, it’s a possibility. 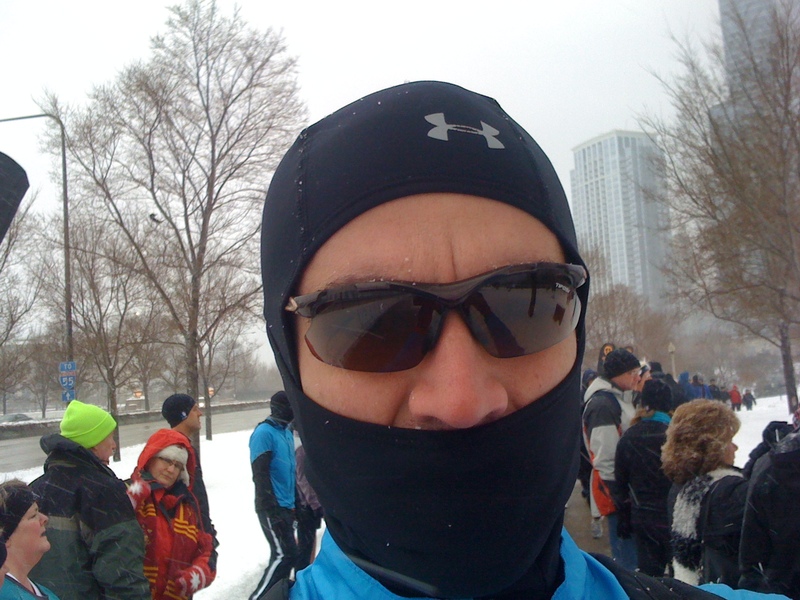 And so went the first race of 2012 — cold, damp, full of hiccups but ultimately successful. Next week we’re shocking the body by running alongside Miami’s palm trees in 70-degrees. Onwards! Oh wow.! That sounds horrible! I can’t even imagine running a half-marathon in those conditions. Enjoy Miami, you earned it! Righ now in Texas it is 65 degrees. Although, the tables will turn this summer when its 110 degrees here and pleasant where you are. Man, that sounds awful. I can’t stand being even remotely cold, so I’m majorly impressed you finished in that weather. Nice job! 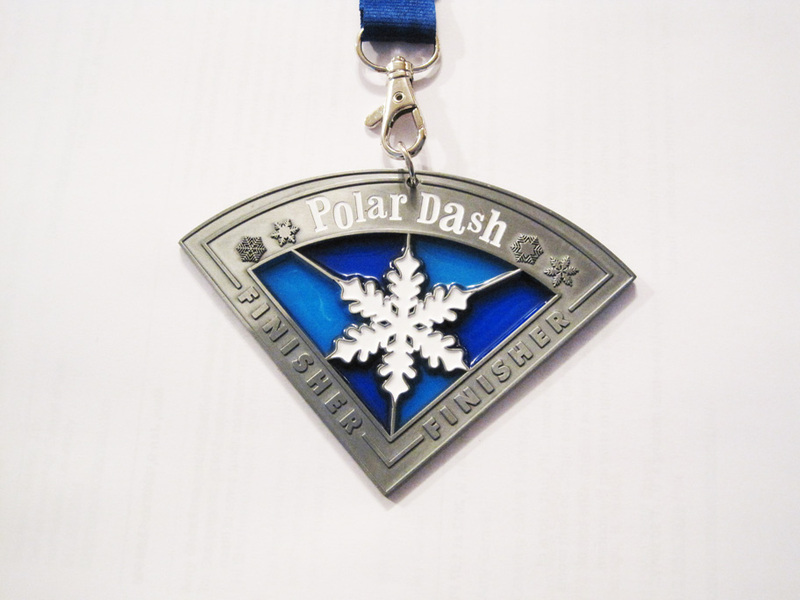 I love these medals that Team Ortho does! I did the Chicago Monster Dash halloween weekend and I also went up to Minneapolis (MN – Check!) for their Lucky 7 Triple 7k St. Patty’s day half. I’d like to do four and maybe get them framed in some way! I think they generally put on a pretty decent race – it sounded like yours was fairly organized, considering the last minute route change. In Chicago they didn’t have all the mile markers up, and in Minneapolis they never provided a course profile, but overall I’ve been really happy with their race management! Congrats on rolling out of bed and electing to run in that Chicago weather! !